I heard some buzz about Mari Smith holding Facebook live Hangouts. As a Facebook marketer, I immediately checked out the noise. I realized that Facebook live Hangouts has huge potential. I delved into the ins and outs of this new medium of communication and saw how easy it is to engage with thousands of fans at the same time. It's one step further to Facebook dominating video marketing. What I like about Facebook live Hangouts is that they're easy to set up. Right now, there's only one Facebook app that allows you to do this, 22Social. However, as live Hangouts becomes more popular, I'm sure more apps will integrate it, too. As an early adopter, I gave Facebook live Hangouts a try. And now, I got it down to a science. Live communication with people gives them a genuine impression of who you are developing a stronger social connection. Your brand's community thrives on the level of positive messages about your business shared among customers. Facebook live Hangouts helps you facilitate this communication through live commenting allowing the person streaming to respond in the moment. Getting an influencer to jump on a live Hangout with you can do wonders for your credibility and driving traffic. Moreover, solving your customer's pain points helps them see you as a reliable source of information. If you use Facebook live Hangouts like a webinar by having people register to view, then you can capture a significant amount of leads. Putting a call-to-action button below your Facebook live Hangout can skyrocket your sales. Why? Live call-to-actions flat-out convert. Live interaction is the best way transfer your message about your vision while giving a face to your brand. This quickly develops more trust and connection before asking them to purchase a product or service. 1. Set a benchmark for value where you can consistently over-deliver. This will keep your fans and customers coming back each time you go live. 2. Communicate a begin and end time in advance. Lacking set expectations of time will confuse your viewers and prevent them from setting aside the right amount of time to participate. 3. Make sure to have good lighting, fast internet, and quality video. These three are essential. 4. Test that the video and sound are on before you start. It's one simple, yet critical step. First, login to your Gmail account, and then go to YouTube. Next, click on the drop-down on the upper left-hand corner and select My Channel. Above the cover photo, select Video Manager. Under Video Manager on the left-hand side, click Live Streaming, then select Events. Now, in the top right of the screen press New live event. The chances are that you'll schedule your first event, so select the date and time you want it to go live. Now choose how you want your video to appear. If you want it to be shown only to a particular group of people (e.g. membership community, customers), then select Unlisted. This option appears under the drop-down on the right side that says Public. When Unlisted, only people who have the direct link or have access to the page where the video is embedded can view it. Put in an excellent title and a nice description, and you're almost ready to go live. Now you can either schedule your event or press Go live now in the upper-right hand corner. 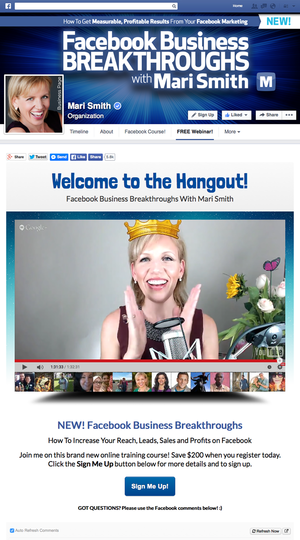 If you want to go live on Facebook, grab the Embed code beneath the YouTube video and copy and paste it into the 22Social media type Hangout. Simply click on the links button at the bottom right of your Google Hangout window, and then copy all of the code within the Video Embed field. Now paste this code into the media type Hangout. Before you begin thinking you're an expert in holding Facebook live Hangouts, know that there are some tools that will give your performance the extra wow! Remember, quality is critical to transferring a clear and effective message. So, if this becomes your go-to medium for customer engagement and acquisition, then utilize the tools above to take your live experience up a notch. Now you can confidently hold a Facebook live Hangout that will impress people far and beyond what they imagined. It's time you take your customer's expectations a little higher.